From Dec-1st - Dec 14th you can pay your library fines with canned goods! 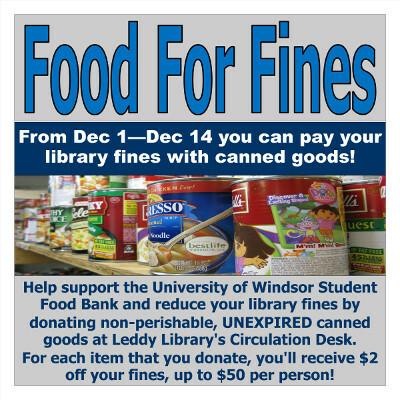 Help support the University of Windsor Student Food Bank and reduce your library fines by donating non-perishable, UNEXPIRED canned goods at Leddy Library's Circulation Desk. For each item that you donate, you'll receive $2 off your fines, up to $50 per person!